Plant-Based in St. Louis highlights restaurants offering awesome vegan eats in my homebase of St. Louis, a hidden gem of plant-based goodness. Dumplings are one of those foods that everybody likes, that immediately conjure the image of comforting home-cooking and stick-to-your-ribs deliciousness. Coming from a Polish heritage, I have eaten a LOT of pierogies (dumplings made out of unleavened dough and stuffed with savory or sweet fillings) in my day- however, since starting a plant-based diet two years ago, I have noticed there is a distinct gap in the St. Louis vegan food scene with respect to any dumpling-y goodness. Thank god Crispy Edge is here to fill that doughy void in my heart. 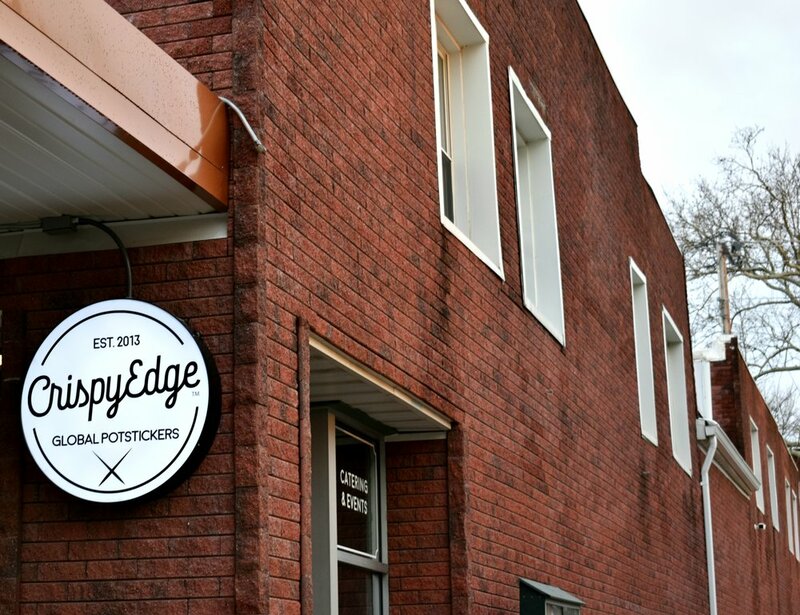 Crispy Edge, opened in April 2018 in the Tower Grove South area of St. Louis, is an entire restaurant devoted to potstickers with an international flair. 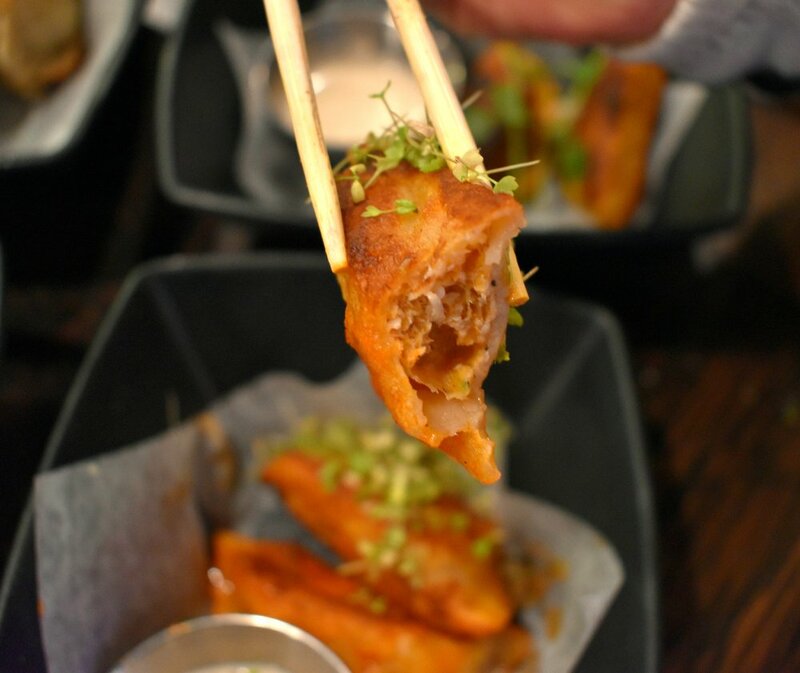 While potstickers originally harken from China, Crispy Edge’s dumplings are inspired by cuisines all over the world, from Indian to American to Vietnamese (sadly, my vegan Polskie heart is still holding out on my beloved pierogi). While meat-based dishes are served here, there are a ton of vegan options- these range from exclusively vegan offerings, like lemongrass chicken (made with lemon-pepper dough and plant-based chicken) and Azteca (with a chia seed dough shell filled with fiery beans), to dumplings that can be either meat or plant-based, such as a Vietnamese spring roll (made from their “house” dough, stuffed with nuoc-cham glazed plant-based chicken and topped with crunchy peanuts) or chorizo date (based on a tumeric dough and stuffed with spicy chorizo-date mixture). In total, a whopping six out of their nine savory potsticker options are vegan or veganizable (all of which are clearly marked on the menu)! Since dumplings are all about comfort, Crispy Edge hasn’t forgotten about dessert- maybe you’d like to try little pocket of apple pie, a sugary sweet cinnamon dough, bursting with a baked apple filling? If dumplings aren’t really your thing (who ARE you?! ), you can take your pick amongst the many plant-based side or salad options, like couscous tabbouleh, garlic baby bok choy, or pickled wasabi cucumber salad. And, of course, like any hip and happening spot, Crispy Edge’s cocktail program is on point, using familiar ingredients to create unique flavor profiles- Fizzy Nut, a creamy gin and coconut milk based drink, accented with coriander and lime, and shaken into a frothy dream would be the perfect accompaniment for a summer evening on this restaurant’s sidewalk patio. The vast availability of vegan eats here is no accident- the owner, David Dresener, told us he wanted to make his food available for all willing and hungry posticker lovers, but more importantly, endeavored to support the sustainability-aspect of plant-based diets amidst growing concerns of overpopulation and global warming. Dresner’s enthusiasm for sustainable operations is evident throughout Crispy Edge’s intimate space- from a vertical garden of herbs and plants that spans one of the restaurant’s main walls to its commitment to locally sourcing as many ingredients as possible. “Locally sourced” is not an exaggeration- the majority of the colorful microgreens and herbs sprinkled atop the restaurant’s dishes are grown on shelving about five feet behind the bar (tended to by City Farm STL). On our visit, Justin and I tried four different types of savory potstickers- the aforementioned tikaa masala, Azteca, and Chorizo, as well as Buffalo Chicken, made from a garlic herb dough, stuffed with plant-based chicken glazed with buffalo sauce. While all of the varieties satisfied my dumpling cravings, the buffalo chicken was my favorite- on several of the dumplings, the plant-based meat fillings (made by Hungry Planet) has an AMAZING texture, but seemed a bit dry- not so in the tender and flavorful buffalo chicken selection. If the fillings could’ve been a bit juicier, Crispy Edge more than makes up for it with their delicious dipping sauces- I will have dreams about the sauce accompanying the tikaa masala potsticker, a creamy coconut-cashew dip, with just the right balance of garlic and spice punch. The dishes’ finishing touches of house-grown herbs added not only a visual delight, but a welcome added element of textural interest (gimme all the microgreens). We also sampled a couple of sides- the wasabi cucumber salad was light and refreshing, but the real standout (debatably of the whole meal?) was the Indian-inspired roasted cauliflower, spiced with coconut curry, toasted coriander, and cilantro. Not only was the cauliflower cooked to perfection, but the combination of spices with the mouthfeel of cauliflower was out of this world. And of course, as the queen of all things sweet, I had to try the apple pie dumpling. The combination of the grainy cinnamon-sugar dough stuffed with liquid-hot apple pie filling was like a warm hug from my grandmother; however, I hope they figure out a dipping sauce to pair it with (the only thing preventing the dish from being completely vegan, as originally conceived, is the bourbon caramel dipping sauce it comes with). I mean, all things are better with whiskey-flavored molten caramel, amiright? Crispy Edge is currently open on Friday from 4-10 pm; Saturday from 8am-2:30 pm and 4-10 pm; and Sunday from 8 am-2 pm. While Crispy Edge has a separate breakfast menu, none of those offerings are currently vegan- but if you’re in need of a potsticker hangover cure at 8 am on a Sunday, don’t fret. 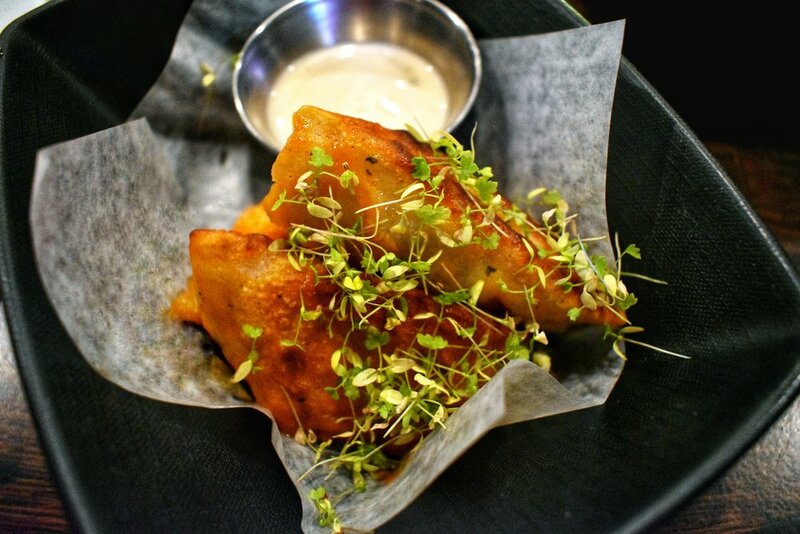 Their potstickers are available all day and Crispy Edge has a killer coffee program, using beans roasted by St. Louis favorite, Blueprint Coffee, as well as a wide variety of teas from the neighboring London Tea Room. If your dumpling hankering is real intense, you’re in luck- Crispy Edge has an entire freezer stocked with premade potstickers for you to take home- all of which are currently vegan! Crispy Edge is located at 4168 Juniata Street, St. Louis, MO 63116, in the charming Tower Grove South neighborhood. What's your favorite style of dumpling from around the world? Empanadas, knishes, momo- as an equal opportunity dumpling enthusiast, I'd love to hear your poison of choice in the comments below!